THCA is another cannabinoid that people are getting very excited about. Non-psychoactive tetrahydrocannabinolic acid (THCA) is one of the most abundant therapeutic compounds produced by raw cannabis plants. 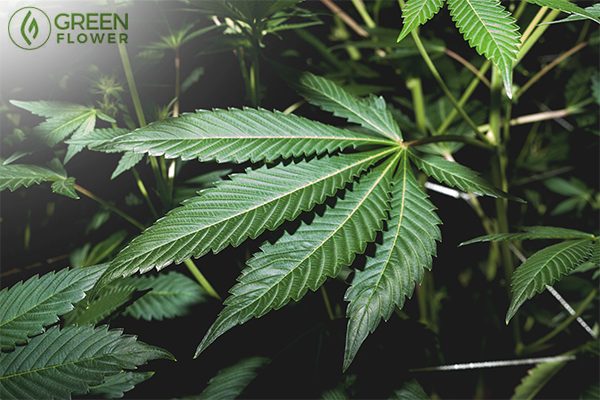 Even though many cannabis enthusiasts already know that inhaling and ingesting cannabis has a wealth of therapeutic properties, there are many surprising benefits of keeping the plant raw. What is THCA exactly? How can you make the most of it? And what do we mean by raw cannabis? Raw cannabis refers to fresh cannabis flower and leaves that have not been dried, cured, or heated. This is important because raw cannabis is abundant in compounds called cannabinoid acids, including THCA and CBDA, which are actually non-psychoactive precursors to cannabinoids THC and CBD. THCA only transforms into mind-bending tetrahydrocannabinol (THC) with heat and/or age. While many write off THCA as an inactive cannabis compound, that sentiment couldn’t be farther from the truth. Although most cannabis research has focused on psychoactive THC, a growing body of evidence suggests that THCA may have crucial healing powers on its own. Most of the world has been overlooking THCA for years. Psychoactive THC may have the greater reputation, but overlooking the potential of raw THCA is a mistake. 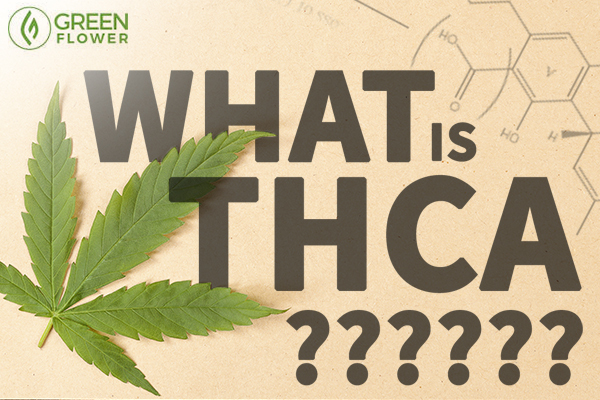 The THCA molecule is birthed from another cannabinoid acid, cannabigerolic acid. Aside from is medicinal properties, THCA is thought to have many functions for the cannabis plant. Research suggests that THCA protects leaves from harmful UV-B light radiation. Additional research has found that THCA produces necrosis in cannabis leaves. This is intriguing since THCA resides in the trichome resin glands that sit on the surface of cannabis leaves and flowers. When cannabis plants secrete this chemical into their leaves, it causes cells to die. This is necrosis. In a way, THCA is sort of like an external immune system that gives the plant the ability to prune itself and recycle nutrients to other parts of the plant. The cannabinoid acid may also help defend the plant against microbial pathogens. When humans consume THCA, they are consuming part of the natural pharmacy that the cannabis plant creates to protect and heal itself. Why is THCA beneficial for people? THCA has a wide range of significant health properties. THCA is far from a benign molecule that simply passes through the body. Instead, this non-psychoactive compound has far-reaching potential in the human body. Inflammation is a painful condition that many people know all too know well. A 2011 study published in the Biological and Pharmaceutical Bulletin found that THCA is a potent anti-inflammatory. THCA inhibits two enzymes commonly targeted by non-steroidal anti-inflammatory (NSAID) medications, like aspirin. These two enzymes are COX-1 and COX-2. Both of these enzymes synthesize pro-inflammatory prostaglandins, which are thought to contribute to pain, fever, and swelling. The laboratory research found that THCA treatment inhibited both COX-1 and COX-2 by over 30 percent, which is significant. An additional study published in 2014 suggests that psychoactive THC actually boosts COX enzymes. This 2011 research is important, then, as it suggests that THCA has some anti-inflammatory potential that is different from its euphoric offspring. The 2014 study even went as far as to suggest that COX-2 inhibitors (like THCA) may increase the medical potential of psychoactive THC treatments. In other words, why not use THCA and THC at the same time? What is THCA's effect on your brain cells and nervous system? A 2012 study published in Phytomedicine found that THCA was protective against an oxidative neurotoxin that is used to model Parkinson’s disease. You see, the challenge with Parkinson’s disease is that dopamine-producing neurons in the brain die off, contributing to disordered movement. Though this 2012 study examined mouse cultures, the researchers concluded that both THCA and psychoactive THC protected dopamine-producing neurons from death. Various compounds in the cannabis plant are neuroprotective antioxidants. This means that they help protect nerve cells from oxidative stress. Oxidative stress occurs when the body cannot properly detoxify or repair the damage caused by free radicals. Pollutants and UV radiation contribute to the formation of free radicals that can cause harm to the body. However, free radicals are also created naturally as breakdown products within the body. They are usually fine but can contribute to disease if they are not properly neutralized. Reactive agents like free radicals steal electrons from other compounds, damaging DNA, lipids, proteins, and cells. This can contribute to cancer and other diseases, like degenerative neurological disorders. When this detoxification process is out of whack, the body cannot properly restore itself to health and free radicals continue to wreak havoc. Antioxidants prevent this damage from occurring. Antioxidants are compounds that reduce oxidative stress and neutralize electron-stealing chemical agents. As a potentially potent antioxidant, it may be beneficial to include a little more THCA into daily life. Cancer is a big one. As mentioned above, researchers have suggested that THCA produces necrosis in plant cells. In humans, this ability may prove useful in cancer treatment. Cancer cells have stopped responding to normal cell death triggers. Early preclinical research shows that THCA may hinder the growth of prostate cancer cells. A 2013 study published in the British Journal of Pharmacology found that THCA had an antiproliferative effect in prostate cancer cells. THCA is not considered the most potent anti-cancer cannabinoid. In fact, the study articulated that cannabidiol (CBD) and cannabichromene (CBC) were the most effective against prostate carcinoma cells. Still, this adds further evidence that including THCA-rich dietary cannabis into a treatment regimen may be worthwhile. Early research of psychoactive THC suggests that the cannabinoid can actually trigger cell death in prostate cancer. Tired of vomiting? Some raw cannabis juice might help. 2013 research published in the British Journal of Pharmacology indicates that THCA has antiemetic properties. Emesis is a fancy term for vomiting. After making a few rats and shrews sick to their stomachs, scientists treated the rodents with THCA. The raw cannabinoid acid reduced nausea behaviors in rats and vomiting in shrews, leading the study authors to conclude that the cannabis compound may be a more potent alternative to THC for control of these conditions. A 2008 study published in the Journal of Pharmacology and Experimental Therapeutics found that both THC and THCA are potent triggers for a cell receptor called TRPA1. This cell receptor is an important target for pain research. Mice without TRPA1 receptors show very little response to pain stimuli, indicating that the protein plays a vital role in pain sensation. The TRPA1 receptor is also thought to contribute to temperature sensing, which may be why compounds like THC tend to make people feel colder. Where do you find THCA? 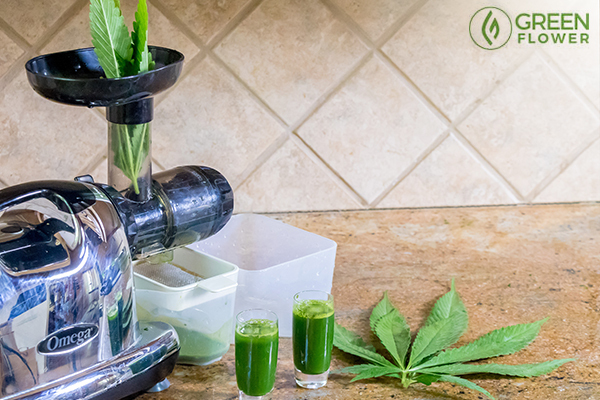 Juicing raw cannabis is just one way to get THCA into your system. The first way people are using THCA is through tinctures. Another way is through raw cannabis, which is an under-appreciated superfood. Will we find raw leaves in grocery stores anytime soon? It’s not likely, but they certainly should be there next to the organic wheatgrass and parsley. 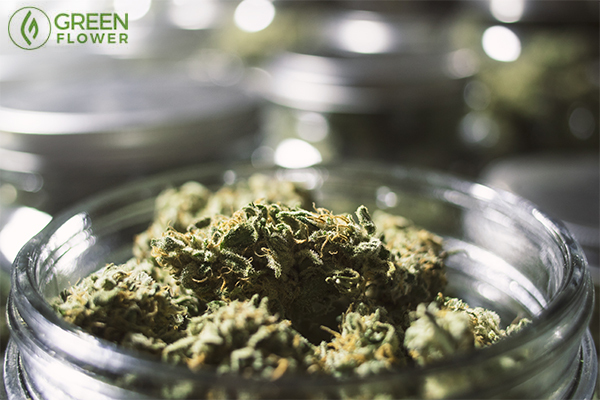 With such a wide variety of health benefits, it’s understandable why many medical cannabis patients include raw cannabis into their treatment regimens. Tip: you can also add chopped cannabis greens to a warm sauce right before serving. Do you want to learn more about specific cannabinoids?